The question of the day is, ‘Do Turkeys Trot?’ The only thing I’ve ever see turkeys do is wander around aimlessly, completely oblivious to their ultimate fate. Just to clarify what a Turkey Trot really is, it was one of the most popular ragtime music dances of 1900-1910. Although maybe after a few of these you may be looking at getting your trot-on. 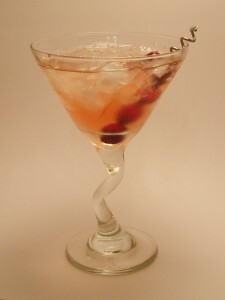 Combine the bourbon, sprite and cranberry juice in a cocktail shaker. Stir, then strain into the cocktail glass filled with crushed ice. Garnish with a skewer of fresh cranberries.